Hey, Anthro, will you stop making gorgeous stuff I can’t afford? Because until then I’ll continue to DIY the whole catalog. 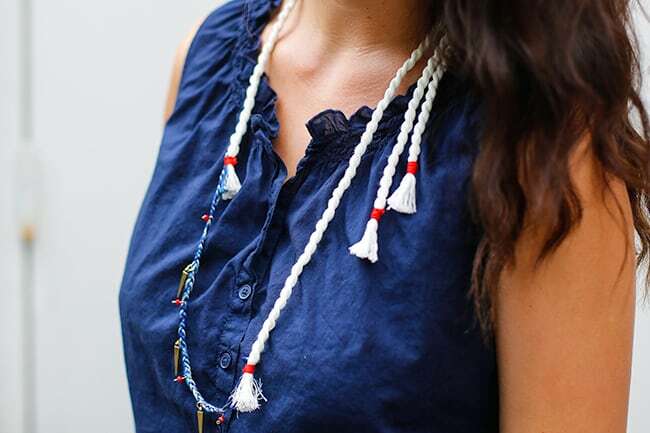 This time, I fell for a casual rope necklace that goes great with the amazing number of blue items in my closet (seriously, I gotta stop buying blue shirts). The tiny spikes with the nautical rope add a touch of edge – there’s something raw and stylish about the contrast. And, as you can probably imagine already, it’s so easy to make. Nine 10-inch long pieces of embroidery thread for braiding. We used various shades of blue. Take a strand of bright embroidery thread and wrap it around one of the rope pieces about an inch above the end of the rope. Repeat on one end of the other piece of rope and set both aside. Now divide the 9 strands of embroidery thread into 3 sections and braid together, leaving an inch of thread loose at both the top and bottom of the braid. Fold the ends of the braided embroidery thread down over the braided section and place on top of the unwrapped rope ends. Wrap a strand of bright embroidery thread around both and glue the end in place. Place the 3 red beads on the head pins. Trim the excess, and using jewelry pliers, bend the end of the headpin into a hook to secure the bead. 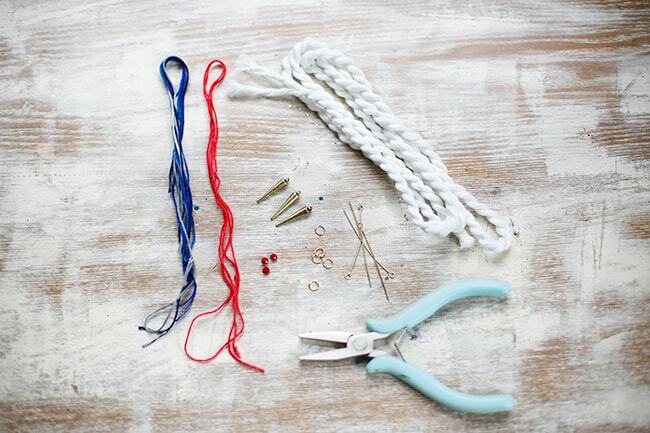 With the hooked end, attach the beads onto the braided embroidery thread. Add a jump ring through the braided embroidery thread. Add the spike and close the jump ring with pliers. Tie a knot to close the necklace. Have you found inspiration at Anthro lately? Lovely. And your model is super cute, too. Yep, I totally make Jenna do all my modeling – I hate taking pictures of me! Love this! The necklace is super cute! Quick question: Where did you get the spike charms? I’m having a hard time finding them. Sorry for the delay in responding Megan! The spike charms I got at Hobby Lobby – they came in a package with a few larger ones and these small ones. Love it! Must make one! This is adorable and a half!! Will definitely be attempting this one! I was in love with Anthropologie in New York but most of the stuff was a little too pricey for me. 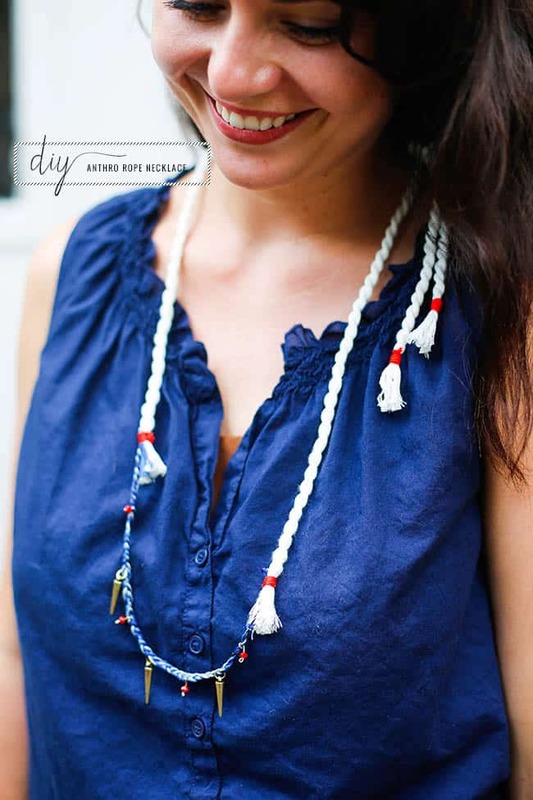 Keep up the DIYs! Lately when the Anthro catalog comes in the mail, I tell Chris to throw it away because if I look at it, I’ll just get depressed. ;) So keep posting these DIYs! This is so pretty and chic! I remember a time when they were not so expensive. They kill me with all their awesomeness. That necklace is super rad!